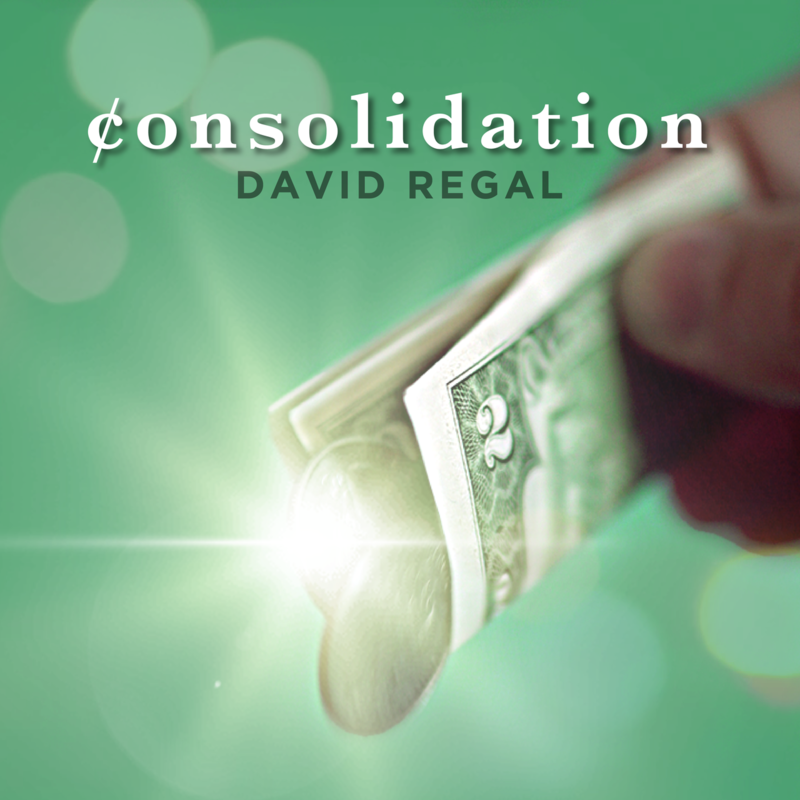 Today, when you order "Consolidation by David Regal", you'll instantly be emailed a Penguin Magic gift certificate. You can spend it on anything you like at Penguin, just like cash. Just complete your order as normal, and within seconds you'll get an email with your gift certificate. This is a great effect , 5 stars all day long. I live in the uk and have ideas on presentation using blank paper. Yes blank paper , were an examined blank piece, changes from being used as a money holder, to a prediction on a blank piece , and yes the money has gone. What an effect. You can do it, and it it will totally amaze anyone watching. What amazed be is that the effect is so simple to learn and so effective in performance. I stunned my wife who may be the world's biggest magic critic. (I don't mean in size.) The tutorial is great. 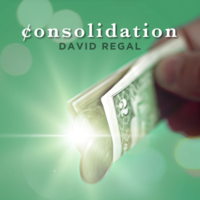 David Regal is one of my favorites, and he does not let me down with this tutorial. It is well worth the price. 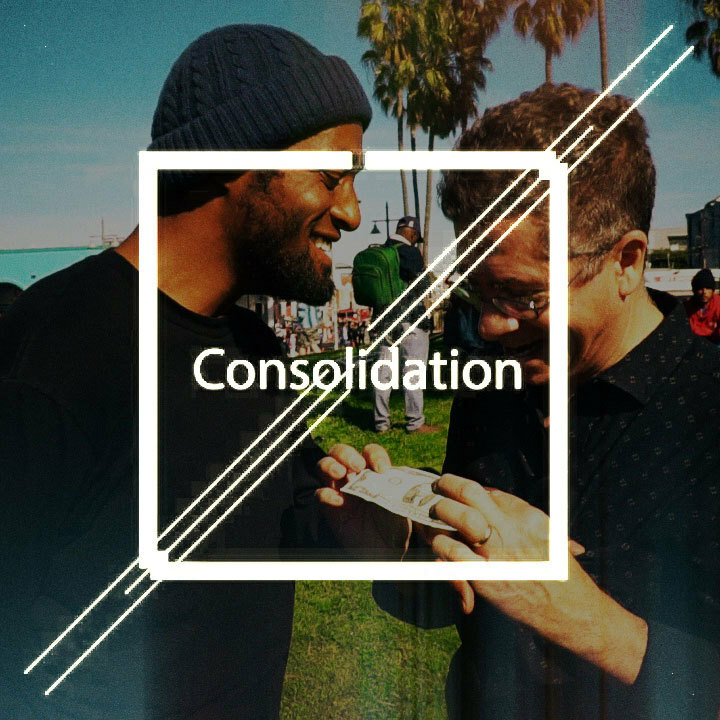 I think Consolidaton is a great impromptu trick for beginners. The sleights (not really sleights... more or less just some subtle finger work) are minimal and the setup is about as minimal as you can make it. I think that most experienced beginners and up will be able to figure this trick out... but still, it's a great trick! There are tons of money tricks out there, but I think this is (for me at least... at least I can't remember any others) the first one that combines a bill and loose change into another single bill. The concept is refreshingly new. This trick has me thinking of some variations I might try, as well as some changes in the patter so that it feels right to me. David does a nice job teaching this simple trick. 1. Is it worth the price? To be honest, I feel this is a $4.95 trick. In my opinion, this is overpriced. I'm not saying that it's not good... I'm just saying it's not $9.95 good. 2. Is this hard? Not at all. Even a beginner can do it. In fact, a beginner SHOULD do it. He or she will only improve with each trick like this. 3. Is there any preparation or arts & crafts? No arts and crafts. Preparation is very minimal. Like 3 seconds tops. The only other prep is that you obviously will want to obtain $2 bills, which may or may not be a challenge for you. It's at least a quick trip to the bank. 4. Is it impressive? Yes. For me personally, the bill + change = bill is a new idea which is already inspiring more ideas for me. 5. Would you recommend this trick? Yes, for beginners. Anyone more advanced will likely be able to figure this trick out. If you can't though, get the trick. Be careful not to hurt your head when you bang it repeatedly against a wall after watching the explanation. 6. Why is everyone else giving this trick 5 stars? I don't know. I think it's a cute trick, but I'm surprised over the excitement this trick seems to be generating. Maybe it's just me... maybe I'm getting old and I'm just being crotchety. That said, this review is my opinion, not anyone else's. So guys, that's my review... if this blows your mind, then I suppose get it. If you're new to magic, get it. If you're at an intermediate level or an experienced beginners, I'd recommend watching the demo a few more times before making a decision. Regal is creative! This is worth more than the trick you see. The dollar could be paper. You don't need the quarter part, or could use another object. You don't need to use the 2 dollar bill, but that is cool. It does not cost you any money the way Regal explains it. 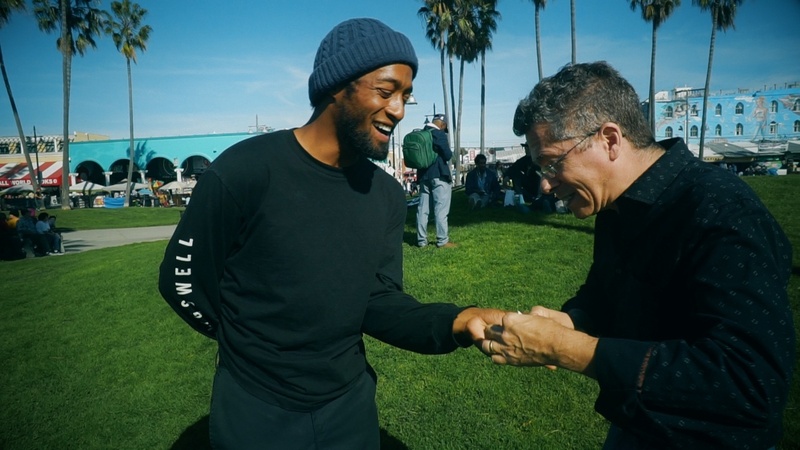 The video is all encompassing and yet short, which I appreciate. So tired of 2 hour videos that could be done in 10 minutes. This is a practical worker. Can be done instantly. No actual sleight of hand here. Fantastic work! Pluses: Very easy to do. No set-up. No arts & crafts. And it doesn't cost you anything to perform since you're trading your $2 for their's. Minuses: You'll need to have your bank order you a supply of $2 bills, since you'll be giving one away every time you perform this. Plus you'll need to find audience members who have a $1 bill AND 4 quarters. (Do people still carry change?) Also, I think bringing out the lighter seems a bit unnatural. I'd like to see a different excuse for going to your pocket. 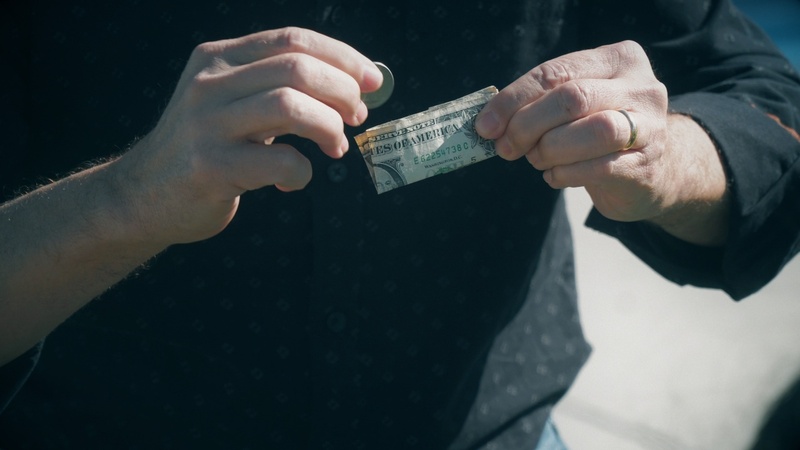 Overall I think this is a clever trick that's easy to do, and it's certainly easy enough to keep a $2 bill tucked in your wallet for the occasions when you'd want to do this. However, I already carry a $2 bill that I use for "Volunteer Swindler"... that I don't give away. Well, this was exactly what I thought it was. So why did I spend $10 on it? Just to get David's handling and even though I have been a performing magician for over 50 years, there is always room for learning. Especially from David. 1) Very simple sleight to learn. I would bet it's nothing new to you. 2) Packs small but plays HUGE. 3) You finish 100% clean. 4) If you set up in advance you can head to the next table or audience and do it again. 6) Even though you take $2.00 and leave them with $2.00 they will fell like you gave them something more. AND YOU DID!!! Most people don't even have a $2.00 bill so they will hold on to that bill for a long time and think of you everytime the look at it. 1) You may find it hard to located people with pocket change. I do a ton of coin and bill magic and it is getting harder and harded to find someone with a quarter let alone 4. If this happens you can always pull out your own money. However, I think it's just another coin/bill trick then. And I have a ton of them. Look for you audience on this one and will pack very BIG. If you like these kinds of Real World tricks, you're going to love this one. 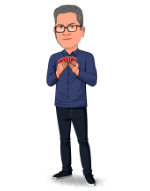 If you do a lot of coin and bill magic, then this will fit right in. 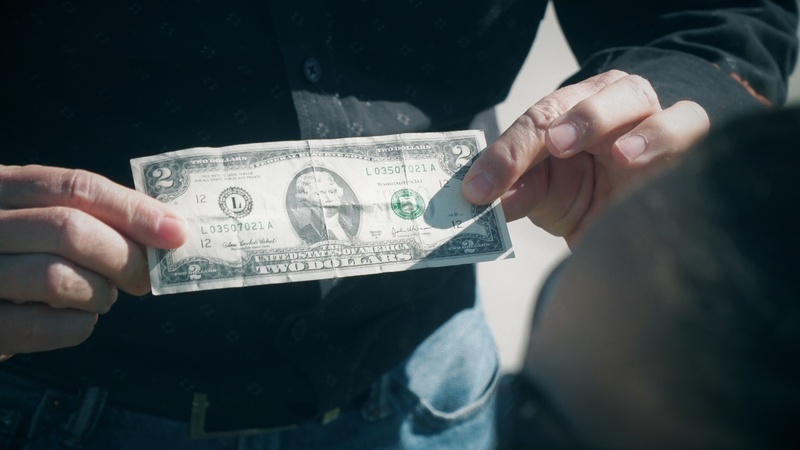 It is so easy that you will carry a ton of $2 bills with you. I really love a bit that can done in a real world setting, as opposed to part of performance. This spontaneous transposition is quick and unexpected, ends clean, and is quite fun. You borrow a dollar bill and 4 quarters - when it is unfolded it has become a 2 dollar bill. Nothing particularly fancy here, but Regal's simple presentation and instructional vid (less than 12 minutes is all it takes) gives this one a big payoff. David Regal is a great creator. I love everything that I have learned from his videos. In under 12 minutes you will know how to perform this enchanting effect. No gimmicks, just one simple sleight & you will be entertaining people wherever you go. Great fun! I really do like this but I don’t know that it’s practical to borrow four quarters and a dollar bill in a world where no one carries cash. Other than that, it really is great. I save my 5 star reviews for those really special tricks that use super clever methods. This is definitely a special trick, in that it hits SO HARD, but is SUPER EASY to do! I'm not even great with my sleights, but this is just so easy. I can't believe how fast I went from watching the video to performing the trick! You can use this anywhere, with anyone, at any time. I don't know what else to tell you, other than if you use money in your work, then SERIOUSLY BUY THIS! I can't stress that enough. This is my favorite release in a long time.